Being a good golfer requires a good level of fitness. Remember, there are 18 long holes you have to play! Thats a lot of walking, and swinging and carrying of your bags. If you really want to improve your score, enjoy the game more and in general feel fitter and healthier, then you need to conside golf resistance training. Regardless of your age, if you start to use resistance traiing on a regular basis, this can help you get into better shape and even help stave off disease. For the golfers who want to add more power to their swing, whilst also giving their stamina and endurance a boost to complete all the 18 holes should consider resistance training, also known as strength training. 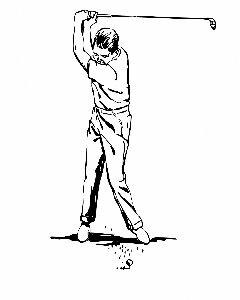 This is also a great way to loosen up muscles, preventing injury whilst out there on the golf course. Resistance training simply involves lifting weights or working out with the resistance machines at a gym. If you want to, you can also do the resistance training at home, just by using everyday items that you already own. To begin with, it is important that you speak with a doctor before undergoing any form of extra excercise. Put simply, resistance training, as previously described should be considered as “strong medicine”, if only because you could hurt yourself if you are unsure of what you’re doing or you aren’t sure of what level you should undertake when you are working out. Providing your doctor, once you have been checked out, gives you the go ahead, you have another important decision to make. To join a gym or not to join a gym? This problem can be solved very easily with a little leg work, so to speak. Find out where the gyms in your local area are situated, then try to visit each one of them. Most gyms will offer a free tour, possibly even a free workout to make sure that they offer the right facilities and equipment for your needs. By taking advantage of the different offers that each gym makes before you join, it will allow you to asses which, if any, is the right gym for you. If you decide that you don’t feel comfortable joining a gym and wouldn’t like to be attending on a regular basis, or if you don’t want to be paying the monthly fees for the membership then you could also consider working out at home by doing the golf resistance training their instead. You may want to make the initial one off investment of buying dumbbells and gym equipment that you could set up in a spare room, therefore eliminating the need for an ongoing monthly payment to the gym. To begin with, though, you may not even need to purchase any of these to do your resistance training. One example of a great excercise for your legs involves just squatting down. This particularly, will work the backs of your legs. Using just the wall for support to lean against, or do it in the middle of the room if you so wish, for a harder work out. Start by placing your hands on your hips, your feet slightly apart, lining up directly under your shoulders.Lower your body down, as far as is comfortable or until your thighs are at a 90 degree angle to the floor, bending you knees, whilst keeping your back straight. Then push up slowly. Repeat until you feel it is starting to work the muscles in your legs. Another resistance training excercise for golfers is to use a chair. Sit on the chair, scoot the front seat whilst keeping your back straight. Then with one foot firmly placed on the floor, straighten your other leg until it is now horizontal, stretched out, parallel to the ground. Now repeat this excercise with the other leg, giving both legs a thorough resistance training work out. A simple resistance training excercise for your arms involves using just 2 cans or beans or soup, or what ever you have at home in your cupboards. Sitting on a chair, with your arms resting relaxed at your sides, a can in each hand, slowly raise your arms, in an arc like direction. Moving your arms upwards and outwards, stretched away from you, until they are now parallel with the ground, pointing away from your shoulders. Now slowly lower them down and repeat. If you wanted to work both legs and arms at the same time. Simply do both squats and arm raises at the same time. Standing in the middle of the room, with your arms by your sides and a can in each arm, begin to squat as described earlier, whilst lowering your body down, being to raise your arms. This should result in your arms being parellel with the ground at the same moment as you are squated down. Slowly raise your body and lower your arms at the same time. This should also result in increased focus, co-ordination, as well as increased muscle strength.